Ah Tuesday. The weather today had me counting down to the weekend. Only three more days! Today was overcast with periods of light rain throughout the day and scattered fog earlier this morning. Much like yesterday, it was humid with temperatures staying around the mid 70s to low 80s. We are expected to get more rain in the upcoming days as Hurricane Florence approaches our area, so stay tuned for our future forecasts. This evening a cold front is expected to remain stalled near the College Park area, bringing with it a higher chance of rain. Low clouds and fog can be expected as temperatures drop slightly into the low to mid 70s with a continued chance of scattered showers and thunderstorms in the area. Winds will remain at 5mph from the Northeast. Tomorrow will be much like today with slightly warmer temperatures and a stronger possibility of thunderstorms in College Park, so make sure to bring an umbrella! Areas of patchy fog will be visible, and winds will continue to come from the Northeast at 5mph. 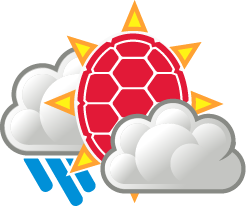 The chance for thunderstorms remains well into the evening, with a low temperature near 72 degrees. Hurricane Florence is expected to approach the East Coast later this week; however, uncertainty remains around how long the storm will stay stationary, its intensity, and how far heavy rains will stretch. Florence is predicted to make landfall as a Category Three hurricane along the coast of the Carolinas this Thursday. Our area will begin to experience some effects of Florence in the form of higher winds and possible precipitation this Thursday around 8pm. Some uncertainty still remains in regards to wind speeds and extent of precipitation, and we are currently considered to have a marginal risk for flash flooding potential. As we learn more about the storm, these factors could change so continue to check back in on our forecasts. Governor Hogan has declared a state of emergency for the state of Maryland, so remember to stay safe and have a hurricane plan prepared. 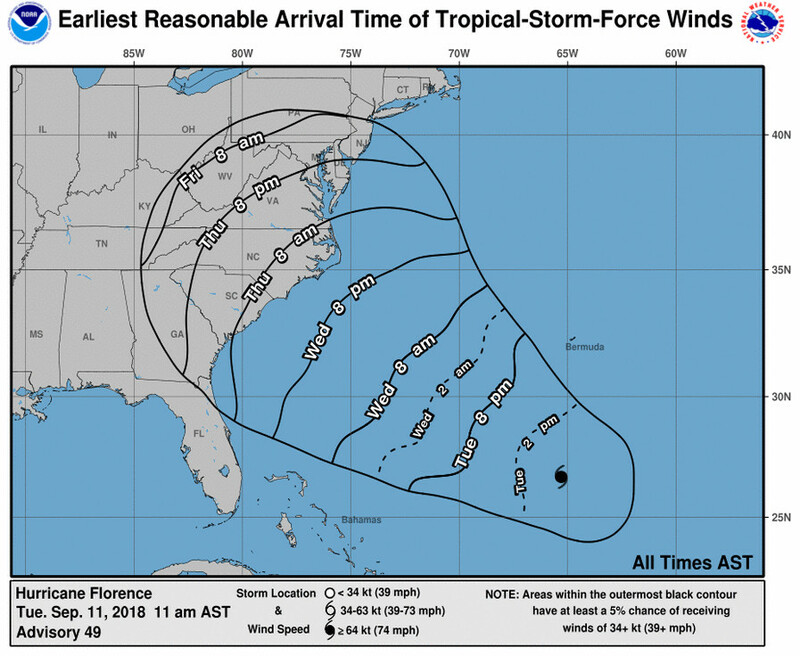 The image above shows potential arrival times for winds from Hurricane Florence (via the National Hurricane Center).